Change the conditions to your advantages by placing this auspicious object in your house. 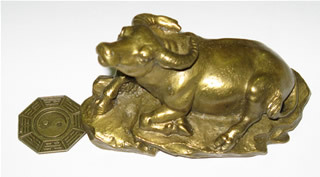 This is the lucky Ox with the Pa Kua coin in the front of the Ox. The timing and posiiton of placement will be advise when you come to collect the items.